सॉनिक और एमी. सॉनिक और एमी. Wallpaper and background images in the सॉनिक और एमी club tagged: sonic and amy. I Love It When Sonic Amy and Shadow are all together!! good job shadow haha now that rocks!!! go one shadow telling amy wre sonic is walking and amy said i don't have to walk home alone. ah!shadow is quite a heart braker!!!! !he never really liked sonic when he was with amy! 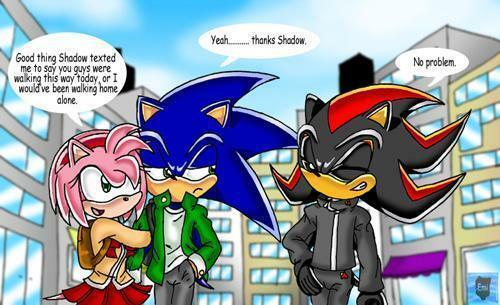 !you know sometimes I think shadow is just hitting on amy to get her away from sonic!heh heh!boys will be boys!!!heh! Idk what Shadow's happy about. Sonic's got a girl that's obsessed with him on his arm while Shadow's got nobody. Haha poor Sonic. Nice one Shadow. And love on Amy! thtz so funny and cute!! lol good on you shadow!!! Sonic should've walk on his own without Shadow then he wouldn't notice that he could walk with Amy alone. oww shut up soinc and be happy .-.